Please feel free to purchase the chapter I wrote for Reframing Information Architecture. I assure you I receive exactly zero dollars for each $40 PDF. 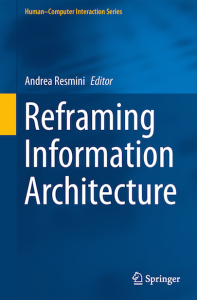 I just ordered a copy of Reframing Information Architecture, a new academic textbook style publication from Springer edited by Andrea Resmini. The book compiles work originally presented in a pre-conference workshop in Baltimore for the IA Summit. It features chapters written by yours truly, Andrew Hinton, Flavia Lacerda, Terence Fenn (et al. ), Duane Degler, Sally Burford, David Fiorito, Roberto Maggi, David Peter Simon and Luca Rosati (et al.). The highest to which man can attain is wonder; and if the prime phenomenon makes him wonder, let him be content. For the second time in as many semesters, Andy Fitzgerald was kind enough to remotely give a rendition of Taxonomy for App Makers for my students in SI658 at U-M, a piece of work he originally presented at the Information Architecture Summit in 2013. There is no limit to the number of times I will delight in hearing this bundle of teachings, and the only limit to the number of times I will go back to the well of images and words in Mr. Fitzgerald’s deck would come from be me no longer wanting or having to explain the concept of information architecture. Architecture is rhetoric for spaces. 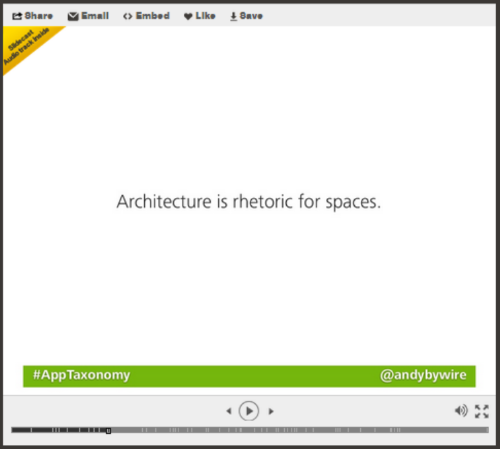 Let that one work on you for a while: rhetoric for spaces. An argument for how things ought to be set up in space. Few of us have worked on the teams that make buildings, but all of us have made arguments. And all of us have arranged things in a space or across spaces because of reasons. That’s as good of a way to set up a conversation about information architecture and taxonomy as any I’ve yet seen or tried. Taxonomy = arrangement of things because of reasons given in or by the argument. Fitzgerald’s framing of taxonomy relative to architecture provides an equally excellent set-up for talking about the inter-relatedness of and distinctions between architecture and design. Design = an instance-articulation of the argument. We might say that when designed things are good, that’s because they’ve been made as an instance-articulation of an over-arching argument that we find persuasive, if not agreeable. The interplay of architecture and rhetoric goes back at least as far as Vitruvius, and I’m eager to see what Fitzgerald has to say at this year’s IA Summit. Landing Clean is a new write-up of a story I’ve told a few times but never before thought to capture in any particular words.